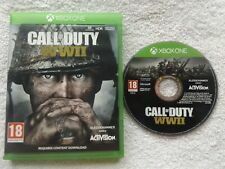 Vendo Call of Duty WW2 per XboxOne. Usato come nuovo, perfettamente funzionante. Spedisco in tutta Italia con Corriere Espresso 24/48h. Vendo Call of duty WWII in condizioni perfette. Der Koop-Modus von Call of Duty: WWII bietet eine neue Storyline. Sie werden außerdem die vielen Möglichkeiten zu schätzen wissen, mit ihren Freunden und der Call of Duty-Community zu interagieren. Die Spieler erleben hautnah eine intensive Reise durch die Schlachtfelder des Kriegs. PRE ORDER CALL OF DUTY WWII VALOR AND PRO EDITION ON Xbox One. THIS IS A STANDARD UK RELEASE VERSION THAT WILL BE COMPATIBLE WITH CONSOLES WORLDWIDE. - Call of Duty: WWII Exclusive Statue. Call of Duty: WWII (Xbox One). Experience Call of Duty combat, the bonds of camaraderie and the unforgiving nature of war against a global power throwing the world into tyranny. We will advise which is applicable. Xbox One/360. Original Xbox. In a Hurry?. Orders must be placed by 2pm. 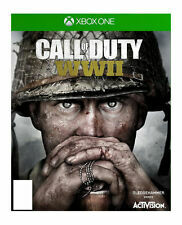 Call of Duty SECONDA GUERRA MONDIALE-XBOX ONE. Compatible with: Xbox ONE S SLIM (It WON'T fit Xbox ONE original or new Xbox One X ). Console MUST be DRY and CLEAN otherwise skin will peel off! Call of Duty: WWII (Xbox One). Call of Duty®: WWII Multiplayer engages players in grounded, fast-paced combat across many of World War II’s most iconic locations. Players will also enjoy exciting new ways to interact and socialise with their friends and the Call of Duty® community. CALL OF DUTY WWII PRO EDITION ON XBOX ONE. THIS IS A STANDARD UK RELEASE VERSION THAT WILL BE COMPATIBLE WITH CONSOLES WORLDWIDE. EXPERIENCE CLASSIC CALL OF DUTY COMBAT, THE BONDS OF CAMARADERIE, AND THE UNFORGIVING NATURE OF WAR AGAINST A GLOBAL POWER THROWING THE WORLD INTO TYRANNY. Call of Duty: seconda guerra mondiale (2) XBOX ONE PRO Edizione Steelbook per Microsoft Xbox One. Strike back and take part in the Allied invasion of Sicily in Operation Husky, the all new objective-based War Mode mission. Plus, experience the latest Nazi Zombies chapter: The Shadowed Throne. Call of Duty: WWII Multiplayer engages players in grounded, fast-paced combat across many of World War II’s most iconic locations. XBOX ONE > Action. Call of Duty®: WWII Nazi Zombies. This village holds a shadowy secret key to an unimaginable and monstrous power. Nothing is as it seems in this zombies horror, as a dark and sinister plot unfolds to unleash an invincible Nazi army of the dead.